Andrew Puzder, chief executive of CKE Restaurants, exits after his meeting with President-elect Donald Trump at Trump International Golf Club in Bedminster, N.J., last month. President-elect Donald Trump has chosen fast-food restaurant CEO Andrew Puzder as his secretary of labor, his transition team announced Thursday. Puzder is the CEO of CKE Holdings, the parent company of Carl's Jr. and Hardee's, and in a statement Trump praised him as someone who "has created and boosted the careers of thousands of Americans." "Andy will fight to make American workers safer and more prosperous by enforcing fair occupational safety standards and ensuring workers receive the benefits they deserve, and he will save small businesses from the crushing burdens of unnecessary regulations that are stunting job growth and suppressing wages," the president-elect said. Puzder's appointment sets up a clash between business and labor groups, as he's been an outspoken critic of raising the minimum wage, the Affordable Care Act and "Nanny State" regulations that he believes have slowed growth in the industry — things like proposed soda bans and restrictions. In 2010, he co-authored a book titled, "Job Creation: How It Really Works and Why Government Doesn't Understand It." 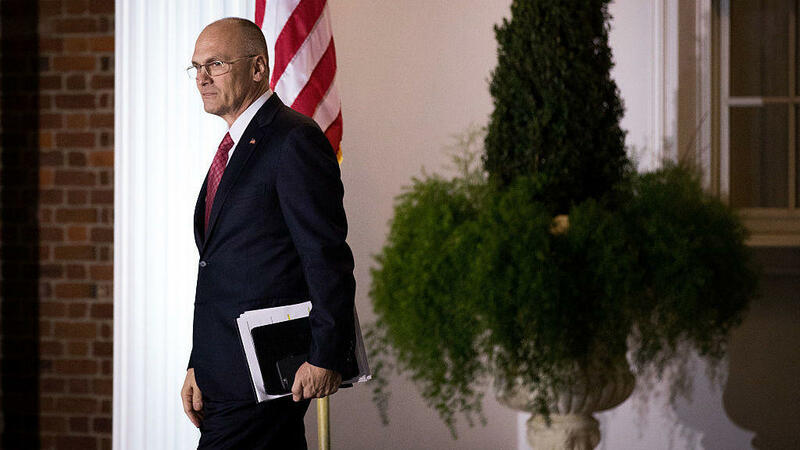 The Obama administration has proposed increasing overtime and workplace safety regulations that Puzder, as head of the Labor Department, could limit or not enforce. As for Democrats' push to raise the minimum wage to $15 an hour from the current federal minimum of $7.25, Puzder said on the Hugh Hewitt radio show in August, "If you give [workers] a raise to $15, you lose about $6,000 per employee. So you actually go from a situation where your, you've got a business that can survive and that has economic strength to a business that you really can't run; you really can't hire people, so, and you can't offset these costs of this magnitude with pricing, even if there was meaningful inflation, which we don't have." Puzder's opposition to overtime regulations comes at a time when the Labor Department's new overtime rule that would have extended overtime eligibility to 4 million Americans is in limbo after a federal judge in Texas blocked its implementation. After the Labor Department issued that rule in May, Puzder wrote in an op-ed in Forbes that it "will simply add to the extensive regulatory maze the Obama Administration has imposed on employers, forcing many to offset increased labor expense by cutting costs elsewhere. In practice, this means reduced opportunities, bonuses, benefits, perks and promotions." Some of the ads his restaurants have run have been criticized as too risque, featuring scantily clad women eating hamburgers. Puzder defended the ads last year, saying: "I like our ads. I like beautiful women eating burgers in bikinis. I think it's very American." Puzder began his career as a lawyer in St. Louis and helped the founder of Carl's Jr. avoid bankruptcy. He eventually relocated to California, where he became the general counsel for CKE and later its CEO. He was a senior adviser to the Trump campaign and donated to it. The company is in the process of moving its headquarters to Nashville, Tenn. CKE's fast food restaurants have 3,750 locations in 44 states and 40 countries and U.S. territories, according to the Wall Street Journal. The company has about 75,000 employees in the U.S. and almost 100,000 worldwide, with total sales topping $4.3 billion. According to filings with the Securities and Exchange Commission in 2012, Puzder's base salary was more than $1 million, in addition to retention bonuses that topped $1.25 million. One issue that could arise in Puzder's confirmation hearings are accusations of abuse from his first wife during the 1980s. The Riverfront Times, a weekly newspaper in St. Louis, Mo., reported on the allegations, in which his ex-wife Lisa Henning, alleged Puzder had abused her on multiple occasions, including an incident where he " hit her, threw her to the floor and unplugged the phone after she tried to call the police for her help." Puzder has called the allegations "baseless," and his wife walked back the accusations of abuse later Thursday to the local paper.